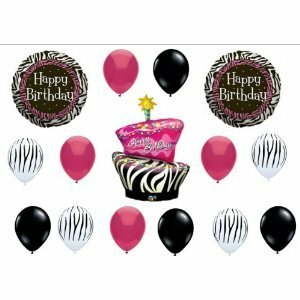 Zebra Stripe Cake Birthday Party Balloons Decorations Supplies Animal Print by Anagram at Animal Backgrounds. MPN: 43230-29844. Hurry! Limited time offer. Offer valid only while supplies last. This listing is for a FIFTEEN (15) piece Happy Birthday Zebra-themed balloon decorating kit!! Perfect decorations for your zebra-themed party! This listing is for a FIFTEEN (15) piece Happy Birthday Zebra-themed balloon decorating kit!! Perfect decorations for your zebra-themed party! Your kit will include the following: One 41" Zebra-print Birthday Cake Mylar shape balloon. Two 18" Zebra print Happy Birthday mylar balloons Four 11" Black/White Zebra striped latex balloons Four 11" Black latex balloons Four 11" Magenta pink latex balloons Sure to be a hit at your party! AND MY SPECIAL FREEBIE "THANK YOU"... Enough curling ribbon in coordinating colors to attach to all balloons! All ballooms are new and shipped uninflated. Just add helium!